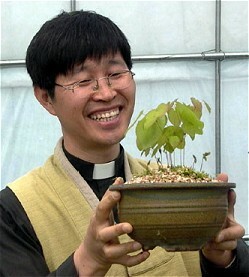 I find this picture of Father Michael Lee with one of his plants delightful. Gardening is one of the activities for the chidren cared for by the BanSongDong Sharing House. Australia’s Anglican Board of Missions (which produced the picture) has supported Christian work in BanSong over many years. BanSongDong is a suburb of the large regional city of Pusan. The land is inferior to that of Pusan proper and infrastructure is poor. The community of 70,000 people lack good roads, cultural activities, medical services, welfare institutions and employment. "So in this place" ABM says "you can find isolated and ill elderly people, single parent families, school children without lunches and breakfast, runaway youth, unemployed people and the BanSongDong Sharing House." Begun in the 1970’s with the support of ABM, the Sharing House meets many needs – food banks for the hungry, breakfast for factory workers, support for low income families, hospice care for the elderly and ill, free medical care for poor women, employment programs for the unemployed and more. Australians are now supporting the development an after school program for children with anti-social behaviour, learning difficulties and from low income families. This is a pioneering program in Korea.